Fascinating and full day in Erfurt. 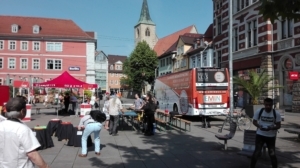 The bus was parked on a central square from 9.00 till 9.00 with a full programme of activities. 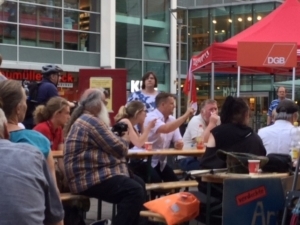 Coordinated by DGB (German Trade Union Federation) with stands from; Caritas, Diakonia, the Armutsnetzwerk, TALISA, AWO and music from Olaf Bessert, gave a lively atmosphere. There was a great and constant interaction with passers-by all day, with many interested to engage in discussions and to sign the bus and the petition. It was very encouraging for the campaign to achieve better minimum incomes. Two political exchanges were arranged on the square. 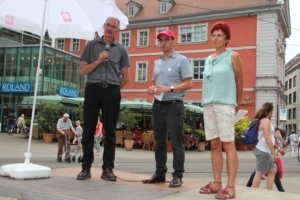 The first was a discussion about the politics of minimum income in the Thüringen region with Karola Stange from Die Linke and Jorg Thamm from the CDU. It became clear that adequate and accessible minimum income schemes is not high on the agenda of the lander government. Perhaps the second exchange of the day was a timely reminder of the need to be active and to be seen to be active on ensuring high level social standards. The second and last exchange of the day with #GabyZimmer (MEP – GUE Group), #JakobvonWeizsacker (MEP – Socialist and Democrats Group) and #SandroWitt (Chairperson of DGB Thüringen), turned into a heated and animated exchange. 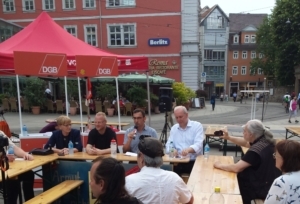 Members of the local branch of the Alternatives for Germany (#AFD) attempted to hijack the meeting but were ably responded to by the panellists. It was part of the dream of the #eminbus to create the type of exchanges that don’t happen in the important conferences that we arrange and attend in our everyday working lives, so it was great to have this exchange in public. The aggressive message and analysis of the AFD members were counteracted with calls for solidarity and reason from the panellists. Such messages and analysis could never be shared by emin supporters but perhaps both are responding to the sense of insecurity that comes from the more precarious societies we are building. One from a way of social engagement and non-violence and the other in a way that increases tensions and fragmentation, despite a desire for more security.